← NRC Event Reports: Please close on the door on your way out…. Workers at Japan’s stricken Fukushima nuclear plant have begun removing fuel rods from a storage pond at the Unit 4 reactor building. The delicate operation is seen as a necessary step in stabilising the site. 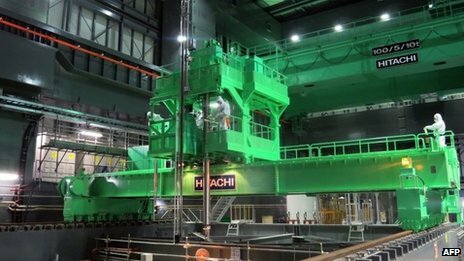 It will take about two days to remove the first 22 fuel rod assemblies, plant operator Tepco says. Overall, more than 1,500 assemblies must be be removed in what correspondents describe as a risky and dangerous operation set to take a year. According to the BBC, the spent fuel rods will be transferred to a fuel pool that is more stable and has an intact cooling system. This entry was posted in Fukushima, Japan, TEPCO and tagged fukushima, Japan, nuclear power, TEPCO. Bookmark the permalink.